The Schindler House exists today as an innovative architectural vision designed and built around a radical lifestyle philosophy that reflected complex relations between the individual and communal. The house is designed in a pinwheel configuration, composed of three wings with studios that open up via sliding walls to shared courtyards. At the heart of the floor plan is a small common space, labeled as the kitchen. As Rudolph Schindler’s vision of individual studios prioritized independence and the communal spaces encouraged exploration of new social structures, one might imagine the kitchen to be a central focal point of this social living experiment. However, little information about its original use and layout is available to visitors. Thus, questions are prompted about how the design functioned with respect to who cooked and where people ate on a regular basis. First-hand accounts of the residents specifically describe special occasions involving cooking and eating in the courtyards, fulfilling Schindler’s lifestyle vision, whereas resident Dione Neutra later installed her own kitchen in one of the studios. This proposal will delve further into these issues to gain insights into the complexities of individual, communal, gender, and class relations surrounding cooking and eating at the house. Through research, a site-specific animated video installation, and a related event, the project will address questions regarding where and how the cooking and eating took place. I will visit the Schindler archives at the University of California, Santa Barbara, to delve further into the daily experience of cooking and eating at the house. I will research the design of other utopian and radical experimental communities in California, as well as broader cultural and historical influences upon the Schindlers’ ideals, such as the Bolshevik revolution, Marx, and the European backgrounds of many of their guests. I will focus on cooking and eating to consider ideal visions of independence, interdependence, and domestic labor. This research will contribute to the development of the animations and event. The animations will be situated at key sites throughout the house—specifically, where it is known or believed that cooking and eating took place, such as Dione Neutra’s kitchen or the outdoor fireplaces. The videos will show looping imagery depicting the minutiae of food preparation and consumption. The scale of the videos will complement their subject, scaling up or down depending on the number of people involved in the activities pictured. A small video of an individual stirring a pan may be placed near the ghost of the kitchenette in the Clyde Chace studio. A detail from a group dinner may be projected near a sliding door leading to an exterior dining space. 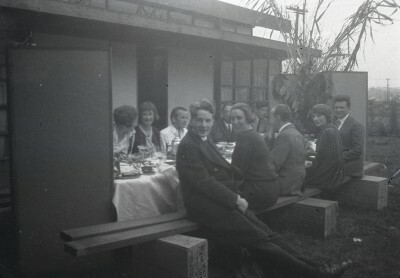 Statements from the archive referencing specific uses of the house, such as noting that Pauline’s mother cooked everyone’s meals and brought them to each person on trays or that Thanksgiving dinner was outdoors, will be included via audio voice-over, interwoven with statements about cooking and eating in other California experimental communities. Together they will compare the labor and enjoyment of domestic activity at the Schindler House and other such communities. In addition to the installations, an event will take place in conjunction with the exhibition that brings together experts on early twentieth-century utopian communities and other radical social experiments and their architecture. Speakers may discuss ideals, designs, and realities for cooking and eating. The event may include a meal shared by speakers and the public. Hillary Mushkin is a Los Angeles-based artist.